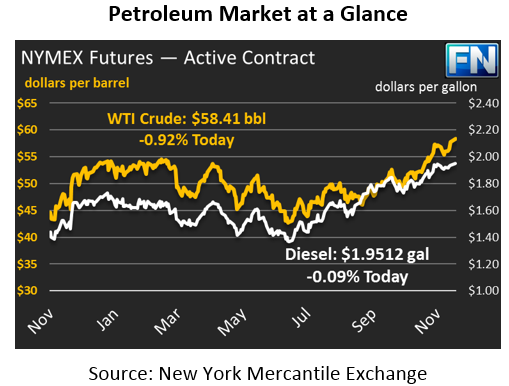 Prices are losing steam this morning after hitting new annual highs on Friday, with WTI crude at one point peaking above $59. On Wednesday, prices opened at $57.12, and gained 90 cents to close above $58. The Thanksgiving holiday was not enough to slow down markets, and prices ended Friday at $58.95, a gain of 3.2% over two days. Markets are quieter this morning, down 54 cents (-0.9%) to $58.41. Unlike crude prices, diesel prices fell last Wednesday in response to a marginal build in U.S. diesel inventories. Friday did see a broad push higher, but prices today are heading towards lower ground once again. Diesel prices opened on Wednesday at $1.9395, and closed Friday at $1.9529, a gain of 1.3 cents (0.7%). Today, diesel prices are down 0.2 cents to $1.9512. Gasoline prices were also held back by a gasoline inventory build but did manage to eke out small gains on Wednesday, followed by strong gains on Friday. Prices opened Wednesday at $1.7661; Friday saw prices close at $1.7880, a gain of 2.2 cents (1.2%). Today, gasoline prices are trading at 1.7863, a loss of 0.2 cents. Markets are watching carefully for foreshadows of what will occur at the OPEC meeting this week. The meeting will take place on Thursday, after which OPEC will announce any changes to its production cut agreement. Most expect a nine-month extension of the deal, though Russia continues to give mixed signals. An extension decision must be unanimous, so just one country can unravel the deal. With markets pricing in a deal extension with record enthusiasm, a failure to extend the deal could send markets lower. WTI crude markets are also receiving support from the extended outage of the Keystone pipeline, which delivers crude oil to Cushing, OK, the receipt point of WTI crude contracts. The Brent-WTI spread has narrowed from the $6.50-range just a few weeks ago to just $5.30 this morning. While OPEC news will move all crude oil indexes, the Keystone outage is only impacting WTI; once crude oil begins flowing to Cushing once again, the spread will likely grow, with WTI prices falling relative to Brent crude.